When buying a new range, you will have a vast selection of options, from built-ins to freestanding, gas to electric. Cooking appliances are the heart of a kitchen. 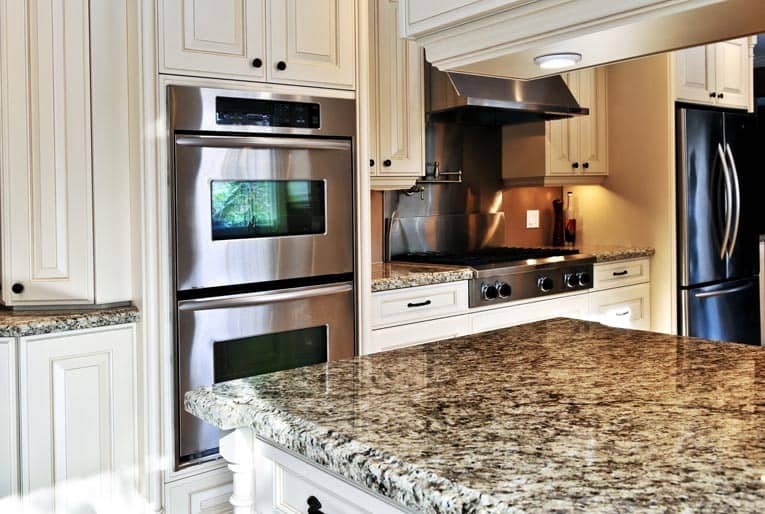 Ranges, ovens, cooktops, microwaves: all of these are critical to cooking, a kitchen’s primary purpose. For this reason, it’s very important to have cooking appliances that operate properly and efficiently. In this section, we’ll help you make intelligent choices when buying these products. For information stove fans and range hoods, please see Cooktop Ventilators and Range Hoods. 1) Freestanding or built in? Do you prefer a freestanding range, with both a cooktop and an oven, or separate build-in wall oven and cooktop units. 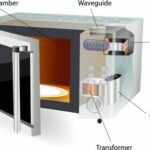 You’ll need to determine the energy source for your cooking appliance. Though it was once true that gas was the better choice for cooktops and electricity the better choice for ovens, recent advances make both heat sources attractive options for either type of cooking. In most areas of the country, gas is more economical than electric power. 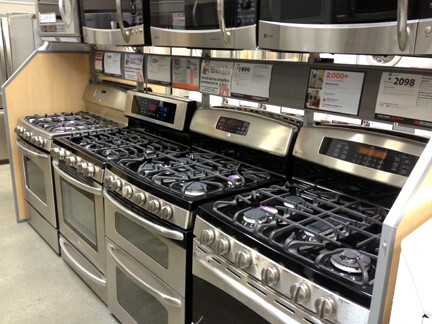 Gas ranges are similar to the electric range shown here, but instead of electrical elements, they have gas burners, gas valves, and require hookup to a gas pipe. 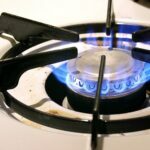 We’ll explore this further in Selecting Gas or Electric. 3) What features and options do you want? 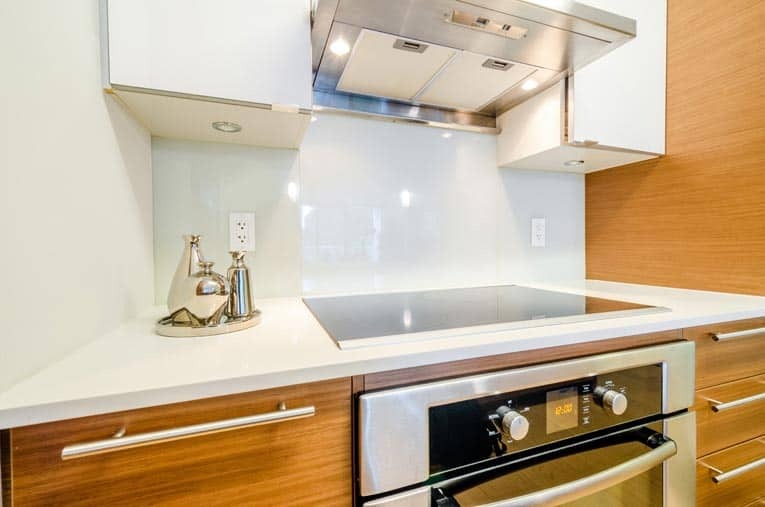 You’ll be given lots of choices, including integrated range hoods and microwave ovens, computerized baking and roasting switches, different numbers and sizes of heating elements or burners, broilers with variable temperatures, digital or analog clocks and timers, and stove-top griddles, woks, and grills. We’ll help you sort out which of these are important and which may not be. Slide-in commercial gas cooktop and oven unit is a complete cooking appliance that’s easy to install. The most economical and popular choice is the freestanding range (as shown below). The standard model measures 30 inches wide and has the cooktop above the oven. More-deluxe models have a microwave or range hood above the cooktop at eye level. The panel at the back of the stovetop usually holds a clock and a timer and sometimes the controls. Standard ranges are designed to slide in between cabinets or drop into a cabinet. With the slide-in type, lips on either side close up the gap between range and countertop to prevent spills from seeping in between. 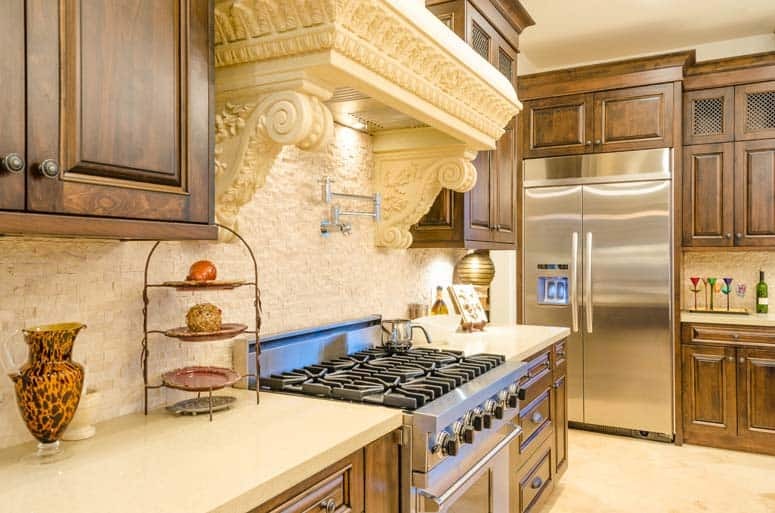 If the range has no backsplash, the wall behind should be protected with something impervious to heat and moisture. A drop-in range rests on top of the cabinet base, so it does not have a storage drawer or warmer unit at the bottom. The top edges overlap the counter surface to prevent spills from seeping into the cabinet below. Among the other range options are commercial ranges and refurbished heirloom ranges, but both are considerably more expensive than the standard range. A commercial range is a good choice only for the serious cook who frequently entertains large numbers of guests. Commercial ranges are heavy (possibly necessitating buttressing the floor), reach dangerously high temperatures, and require a major time commitment in cleaning and maintenance. Electric coil elements are not as responsive as gas but are the fastest heating of electric models. For most homeowners, a hybrid ”commercial/residential” model is a better bet. These combine the capacity and look of a commercial range but without the drawbacks. However, they are relatively expensive. What heirloom ranges contain in nostalgia and charm they lack in cooking space and such modern features as a self-cleaning setting. Some new models attempt to capture the look of grandmother’s range but at a price. Infrared drop-in electric cooktop offers a smooth, easy-to-clean cooking surface. Electric element ranges. Of all the types of electrical elements, coils heat up the fastest and therefore save on energy and energy costs. With dual-watt coils, the cook can match the setting to the size of the pan. To heat a small pot, only the interior coils heat up; both coils heat for larger pots and pans. Smooth-top electric ranges. Quickly heating radiant ribbons or coil elements sit beneath a ceramic-glass surface, which provides for easy cleanup. Drop-in gas stove heats instantly and offers nuanced control. Most new models come with safety features to prevent accidental burning because, with earlier models, it was not obvious when a burner was hot. Conventional gas ranges. In general, as compared to electric, gas allows cooks to control the heat source more quickly and precisely, a must for any type of cuisine that involves quick saute methods. Some cooktops can be converted into a griddle and/or grill and have downdraft or backdraft ventilation. Commercial-style gas ranges. These pro-style ovens have all the benefits of a commercial range without the drawbacks. Calibrated controls adjust gas burners to hold steady, even flames; a grate in the center allows for shifting pans without having to lift them. 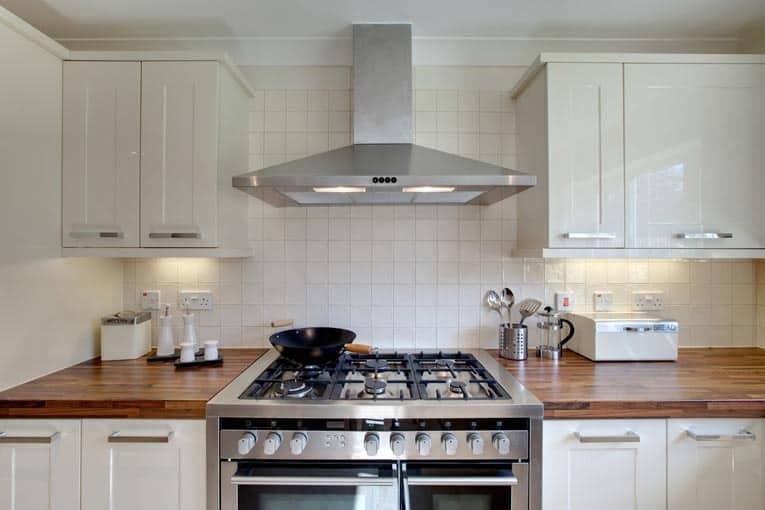 A cooktop is simply the top of a range separately located from the oven below. It fits into a cutout in the countertop and can either rim the counter or be flush with it. Electric cooktop sits flush on the counter. The depth can run anywhere from a slim 2 1/2 inches, which retains a generous amount of space in the cabinet below, to 8 inches; however, models with a downdraft ventilation system can measure 16 1/2 inches deep. Like the cooktops on gas and electric ranges, most models come with specialized accessories that fit over a pair of burners to convert them into a griddle or grill. Built-in wall ovens are popular because they can be blended in with the cabinetry and set at heights that are convenient for use. With these, it’s easy to peek in to see the bread rising or the turkey browning. Built-in double ovens are complimented by a drop-in gas range unit that includes a stainless-steel backsplash and range hood. The standard width of a wall oven is 30 inches, but you can buy a narrower oven if you shop around. 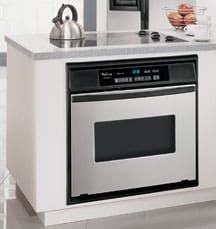 If your kitchen can afford the space, you may want to opt for a double oven; with one of these, you can roast the turkey and bake the bread at the same time. Some busy kitchens have both a wall oven and a range. The wall oven handles everyday baking and broiling, and the range’s oven kicks in for multiple course meals and large parties. Convection oven looks like a conventional oven but cooks faster and more efficiently because its internal fan circulates heated air. Convection ovens cook faster and more evenly than most conventional ovens because, inside the oven, a high-speed fan circulates the heated air around the food being cooked. Cooks often testify that foods baked in a convection oven taste more delicate, brown more evenly, and stay juicier. 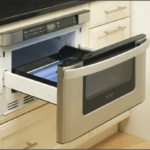 Convection ovens are sold in both gas and electric models and may be built into cabinetry or come as part of a freestanding range. There are two types: the standard type with burners at the bottom of the oven, and the “true” convection oven with the burner at the rear of the oven chamber. The latter type is preferred for its even heat distribution. Whether you are buying a new range or cooktop, be sure to select a model with burners sized to fit your pots and pans and that are suitable for the type of cooking you do.A typical configuration includes one large burner, two medium burners, and one small burner. Of course, if you frequently cook for a large family or groups, you will probably need at least two large burners. Just keep in mind that the cooktop must be wider than the standard 30 inches if you want more than four burners. Some cooktops offer two pairs of burners with a central grate on which you can rest hot pots, a grill for indoor barbecuing, or a griddle (as shown here). Self-cleaning ovens can save you a world of rubber-gloved grief. Though powerful chemical oven cleaners are made, these pollute the air in your home and are a hassle to use. There are two types of self-cleaning ovens. The conventional type can be set to heat up to 1,000 degrees Fahrenheit so that they nuke all food debris into a dusty gray ash that can then be wiped away. A continuous-cleaning oven has a special interior finish that oxidizes food spills every time you use the oven. This works pretty well but is not effective for large spills. Most ranges have a broiler at the top. 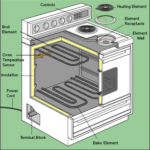 With some, you can vary the temperature of the broiling element; others are either off or on. Three racks are better than two; they give you more options, including the option to remove one or two of the racks. A half rack is also helpful; it will let you bake something tall along with short items. Watch for electronic controls that will enable you to do more than turn the unit off and on and set the temperature. For example, some will allow you to program your cooking or delay the start of it. Be sure the controls are easy to use. If you are going with a gas stove or oven, look for a model offering pilotless ignition. This electronic ignition system means you won’t waste money and energy keeping a pilot light burning. A stove that has a compartment with a separate temperature control is convenient for keeping some foods warm while cooking others. If you buy a freestanding range, it probably will have a storage drawer. Types with a removable liner are easiest to clean. This childproofing feature prevents small children from opening the oven door. See more about child safety in the kitchen.